The Toddler Worm Maze is great for the little ones who like to explore. Follow the path of the giant hungry worm munching his way through deliciously fun play pods. This unit is 15� long x 20' wide' x 4' tall. (Size can depend on configuration.) The children can look out through clear windows in the apple, storybook or cheese with the mouse watching over them children. Primary colors make it a hit with boys and girls! This unit can even be set up in the house, and has a protective padded floor for added safety and fun. This unit is suitable for children up to 5 years old. 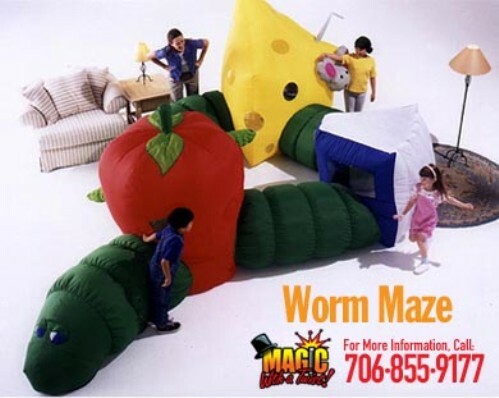 The Toddler Worm Maze requires a relatively flat area about 18�x 3� and within 100' of an electrical outlet. We prefer to set the inflatable up on grass but some concrete or asphalt maybe acceptable as well.